S. T. Joshi (b. 1958) is a leading authority on H. P. Lovecraft, Ambrose Bierce, H. L. Mencken, and other writers, mostly in the realms of supernatural and fantasy fiction. He has edited corrected editions of the works of Lovecraft, several annotated editions of Bierce and Mencken, and has written such critical studies as The Weird Tale (1990) and The Modern Weird Tale (2001). His award-winning biography, H. P. Lovecraft: A Life (1996), has already become a collector's item. An expanded and updated version, I Am Providence: The Life and Times of H. P. Lovecraft , was published in 2 volumes in 2010. But critical, biographical, and editorial work on weird fiction is only one aspect of Joshi's multifaceted output. 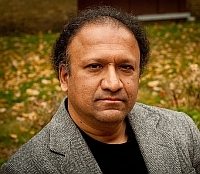 A prominent atheist, Joshi has published the anthology Atheism: A Reader (2000) and the anti-religious polemic, God's Defenders: What They Believe and Why They Are Wrong (2003). He has also compiled an important anthology on race relations, Documents of American Prejudice (1999). Joshi has compiled bibliographies of H. P. Lovecraft (1981; revised 2009), Lord Dunsany (1993), Ramsey Campbell (1995), Ambrose Bierce (1999), Gore Vidal (2007), and H. L. Mencken (2009). He has edited Supernatural Literature of the World: An Encyclopedia (2005), Icons of Horror and the Supernatural (2006), and Icons of Unbelief (2008). His recent monographs include The Angry Right (2006), Junk Fiction: America’s Obsession with Bestsellers (2009), and The Unbelievers: The Evolution of Modern Atheism (2011). He has also published two works of detective fiction and has written a supernatural novel centering around H. P. Lovecraft, The Assaults of Chaos . This site offers a comprehensive view of S. T. Joshi, including an autobiography, a full bibliography of his published writings, photographs of Joshi and his family, discussions of Joshi's works in progress, and links to publishers and related sites. We plan to update this site regularly, so that readers can be kept informed of Joshi's latest works, his forthcoming projects, and even his travels to conventions and on publicity tours.